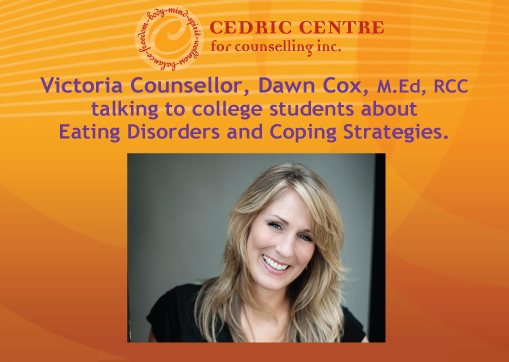 This week we have a new video for you of Dawn Cox going over Positive and Negative coping strategies with students at Camosun College in Victoria during a lesson on Eating Disorders. It is a good, quick review with examples of each. Dawn reminds us of how important it is to recognize strategies for what they are and set yourself up with lots of positive coping strategies that you can rely on in your ‘tool box’, so you don’t end up using food or other negative coping strategies. 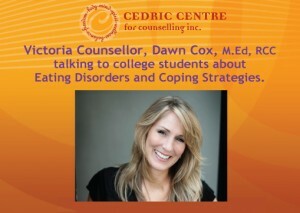 “Coping Strategies reviewed by Dawn Cox, CEDRIC Eating Disorder Counsellor for Victoria” Enjoy the Video!